Mohammad Bakri - Who is Mohammad Bakri? Renowned Palestinian director, producer, screenwriter and actor, Mohammad Bakri, has earned several professional awards, nominations and honorable mentions for his work in theater and film. In a private interview, Bakri relates how he experienced sudden awakening one day when as a child in Israeli schools he found himself being taught to sing the songs of his oppressors. He began to think then that he would work to tell the truth of Palestinian history – and tell it first and foremost to Israelis. As the sensitive young actor developed into his art, the truth became evermore distilled and powerful until the documentary "Jenin Jenin" reached a worldwide audience and provoked official Israeli anger. Since then, Bakri has been pursued by endless attack and currently is undergoing a hollow suit by six Israeli soldiers claiming that he defamed them and spoilt their lives. Born in Galilee, in the village of Bi’ina, Israel, in 1953, Mohammad graduated with a degree in Arabic Literature from Tel-Aviv University, in 1976. 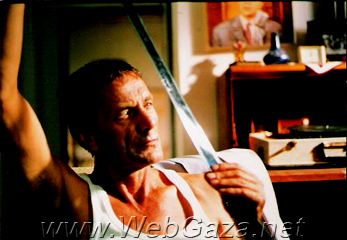 He proceeded to professionally act in Israel and the West Bank (Habima, Carmeni, Haifa and Alkasaba theaters), and in several international films, including "Private," by Saverio Costanzo, Italy, 2004; "Desperado Square," by Beny Toraty, 2001; "Sous Les Pieds des Femmes," by Rachida Krim, in France, 1997; "The Tale of the three Jewels," by Michel Khleifi, in Belgium, 1994; "Rami og Julie," by Erik Clausen, Denmark, 1988, and others. The films in which Bakri has starred have been produced and successfully featured, globally—from France and Canada, to Israel and Palestine, have earned Academy Awards, several nominations, and have rendered him a highly valuable and accomplished actor and performer. Bakri also produced and directed three documentary films dealing exclusively with the Palestinian political struggle: He produced "1948" in 1998, "Jenin, Jenin", in 2002 and most recently the 2004 film, "Since You Left." In each documentary, Bakri brings the camera and microphone to residents’ and refugee’s homes, meticulously poses questions relating to their experiences of the subject matter, and selectively pieces together recorded fragments to compose award winning, fact-to-fact features. "Jenin-Jenin" earned two awards: the "Best Film" award at the Carthage International Film Festival, 2002, and the International Prize for Mediterranean Documentary Filmmaking and Reporting. Ironically, however, this same film has subjected Bakri to Israeli censorship and contempt, and to the current lawsuit now absorbing his energy and modest means. Bakri is indeed a one-man player. His 3 documentaries demonstrate this skill which he also sublimates in his one-man plays: "The Pessoptimist," 1986, "The Anchor," 1994, "Season of Migration to the North," and "Abu Marmar," 1999. Each is based on a novel written by a renowned author. (He himself wrote "Abu Marmar." It is about prisoners in Palestine). When asked, ‘what do you value most, fame or monetary success,’ Bakri response is as follows: "Neither. The most important thing to me is to be myself." Bakri’s eagerness, passion and creative expertise in the realms of theater and film have, consequently, lent him the skill to successfully perform, direct, document and produce. He has directed "A Day in Our Time," 2004, "A View from the Bridge," 2002, "Samir and Yonothan," 2001, all of which are too, based on famous plays and books. The first is based on a play by Syrian Saadallah Wannous, the next on a play by Arthur Miller, and the final is based on a book by Daniella Carmi. Currently, Bakri travels worldwide to perform and to screen his documentaries. He is frequently invited to New York, Tokyo, Paris, Buenos Aires, and others. Evidently a Global Nomad and traveler, Bakri has established himself as an astonishing actor, an accomplished performer and director, and a man frequently being awarded and professionally acknowledged for his devotion to the field. A Palestinian Arab living in Israel, when asked what his highest goals are, he answers: "It is my duty and passion to tell my story and the story of my people." ‘Telling stories’ is the least of Mohammad Bakri’s accomplishments, however. Perceived as a hero by the Palestinians, an aesthetic superior by his colleagues, and a serious entertainer and spokesperson for the Palestinian cause by the rest of the world, Bakri has proven that his work is ongoing and worthy of international praise and recognition. He is superior in his work, charismatic and zealous in public discussion, and astoundingly refined, sincere and honest in person. Aside from his travels, he lives in Israel with his wife of over 30 years and six lovely, artistic children.